Here are a list of shihonage （四方投げ） concepts that have helped me a lot. Please note that I am not claiming that any are the One True Way. Rather, this is my understanding at this moment. My understanding is subject to regular, painful (to me), evolution. As such, when next I write about Shihonage I may hold the belief that it can only be performed under the influence of grass hula-skirts and coconut shells. 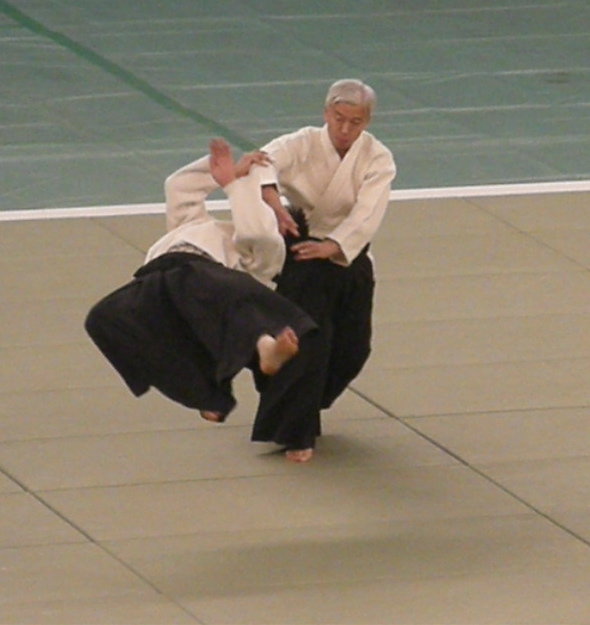 I remember being taught shihonage by a sempai who insisted that nage has to be shoulder-to-shoulder with uke when executing the technique. That’s fine and dandy but it is possible to gain significant mechanical advantage for nage if they enter deeply enough to place their shoulder slightly behind that of uke. This will allow nage to use their own shoulder as a fulcrum. Really, this is cool, try it. 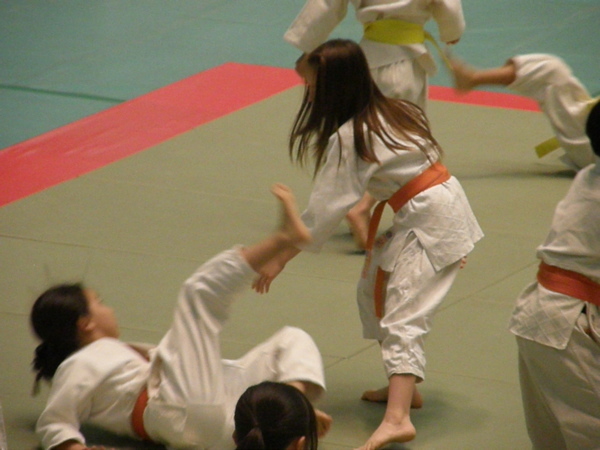 There is a saying among jujutsuka: “Attack pain”. Cranking on uke’s elbow can work but it may also telegraph an intention thus providing uke with a focal point to resist and attack their pain. I believe that the goal of this technique should be for uke to not feel as though anything is wrong until it is catastrophically too late. With that in mind, extending Uke’s arm is what I see as key to the core of shihonage. Cranking up uke’s elbow can work and there is some serious martial validity in doing something that makes uke feel as though their arm is about to break but they will know that something is going on that is bad for them. If nage forms their arms into a broad circle with uke’s arm resting on top nage’s they can then lower their center and smoothly rotate from their hips. At all times through this rotation, nage’s hands should be directly in front of their own body with feeling of forward extension. At the ultimate point of rotation and extension, nage should end up facing uke’s back or at worst their ear. If you nage does not rotate that far and winds up trying to throw against the direction uke is facing then uke is in a much stronger position to escape or counter. One ugly counter from this position is for uke to simply reach around with their free hand and grab the back of nage’s gi. If uke can maintain their grip, nage’s throw will take both down with momentum in uke’s favor. Finally, to cut down or cut out? Both work and I think both should be practiced. Lately, I have preferred to cut down to my foot as that keeps me in position to hold uke by putting my weight on their elbow while holding it across their face. When executed properly, even shihonage can leave uke with that irritating “Why am I on the ground?” feeling. The other day I partnered with one of the uchi-deshi and got half of a great practice. Unfortunately for me, he had to leave midway to help with the 7:00AM beginner class. When he left I went looking for a pair to join. The first were two young women, both about a head shorter than me who looked as though they were having a lot of fun together. Cutting in seemed rude so I went on to the next pair — an odd couple. One was a very tall, French, fifth dan and the other a Nepalese mudansha about my height. They were having a serious exchange in which the big guy was pounding the crap out of the mudansha (in a loving and caring sort of way). My playful side called out and they offered to let me play too. The mudansha is a physically strong and flexible fellow who also studies karate and judo. Altogether that made working with him interesting. He fought every technique so I very carefully splattered him to a degree that he seemed to find satisfying and occasionally broke out of his pins to show that I really was paying attention. The tall French sempai was altogether a different story. In terms of proficiency, the difference between us was not quite as great as that between me and the mudansha — I really want to believe that but it may just be hubris. He made me earn every throw and pin while calmly and casually reversing every opening. 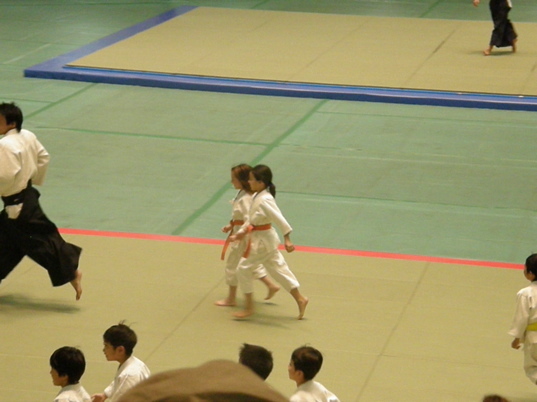 Kobayashi sensei was substituting for Doshu that morning and he came by a few times and watched us. I’m not sure why but once he sort of shook his head, smiled and wandered away. It wasn’t that we were intentionally ignoring what he had demonstrated but rather there were such vast differences in size, strength, skill and intent that exactly replicating what he demonstrated was difficult. Watching the mudansha trying to perform morote tori kokyu nage (諸手取り呼吸投げ: two handed breath throw) on a guy thirty centimeters taller and five black belt ranks above him was not so much a study of how to do the technique as it was a study of how to teach someone how to do it. finish it was pretty clear that he had experienced an “Aha!” of some sort. I carefully stored that away with the hope that someday I will be able to provide someone with a similar epiphany. 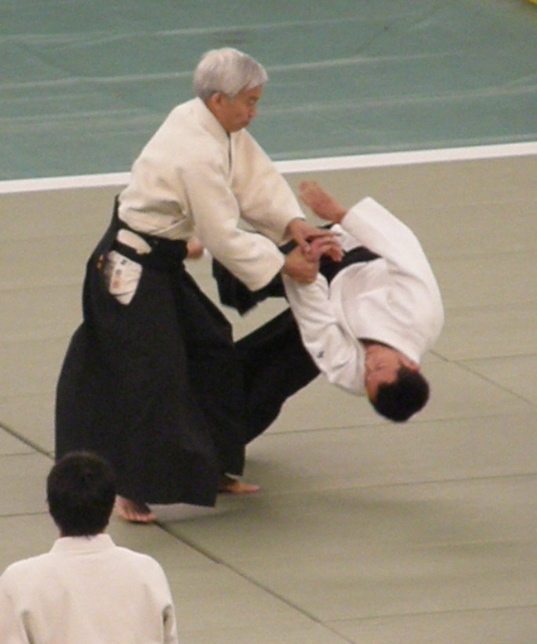 Last week I had one of the most wonderful experiences of my career in Aikido. I attended another weapons training camp in Iwama but that wasn’t it. I met, trained with and swapped gossip with a famous American teacher but that wasn’t it either. The wonderful experience was that my son attended his first adult class, Doshu’s ichiban geiko, and trained with me. The previous week I had watched Doshu vigorously throwing Waka-Sensei around and when it was over Doshu tossed in some gentle fatherly ribbing. It looked like great fun and when Doshu saw my smile he asked what was up with that. I told him that I wished that I could do that with my son too. When Doshu found out that Ray was eleven, he told me to bring him in on a school holiday. That was it, official sanction for something that I’d been wanting to do for quite awhile. The following Monday was a national holiday and on most national holidays Honbu Dojo is closed. 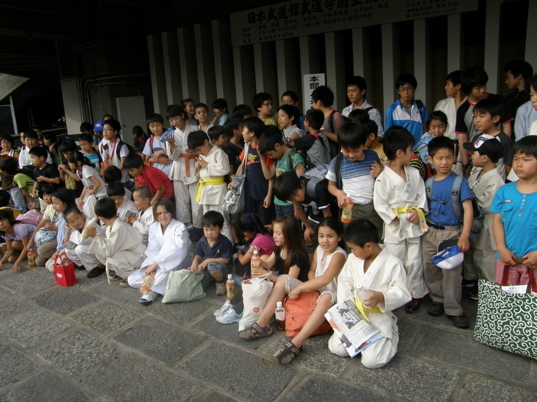 However this was “Sports Day” and the Dojo stayed open for some classes. With school closed Ray didn’t have an excuse to NOT go to morning class. On his own he is an early riser so I didn’t feel too guilty booting him out of bed and tossing him his dogi. After much complaining he gave in to the inevitable and we biked over. As we entered the dojo, Ray handed over his member card and formally announced to the people at the desk that he would be attending today’s class. I was surprised, the uchi-deshi behind the desk amused and Doshu seemed totally confused until he saw me smiling and pointing. Doshu smiled and nodded and so we went in — first hurdle cleared with extra-style points awarded for Ray’s little announcement. 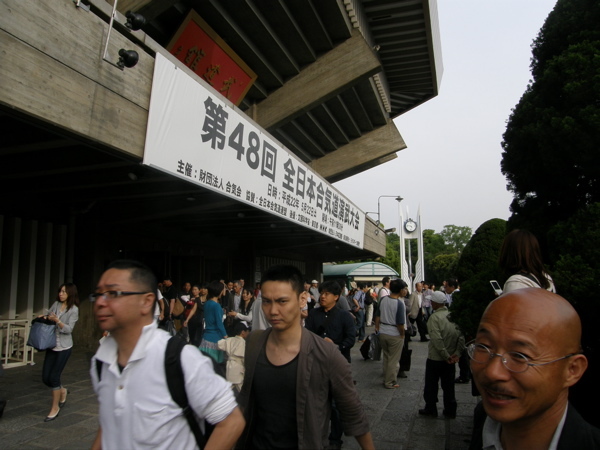 In the third floor changing room I put on my hakama and Ray worriedly looked around at the crowd. The place can get pretty packed and there were several tour groups in that day from Russia, France (of course) and Scotland. It was crowded. I mentioned to Ray that the warm-up was different than he was used to so he could just follow along. He did and had no problems. I picked a spot near the “Silver corner” where the crazy old men work out. Ray said that wanted to meet Yoda and then asked about another of my favorite old-guys. Sadly, Yoda was out that day but he did say hello to quite a few of the codgers. This was our first time to take a class together and train as partners. Ray went out of his way to throw me as hard as he could and for a pre-2nd kyu, his kotegaeshi and shihonage are pretty hard-core. This was his first ever adult class and as icing on the cake, Doshu came around twice to throw him. Afterward, Ray said it was physically really hard but he wanted to come and do it again. Appropriate superlatives to describe how that made me feel just sound silly — I was, and am, ridiculously proud of my son. I had the opportunity to enjoy an evening class recently (ed. it was March). This usually just means a new set of students with whom to train but in this case it also meant a new Honbu Shihan. I had never trained under this sensei but had heard a bit of grousing about his teaching style, mind you, the harshest complaint I had heard was that he talks too much in class. For an Aikido sensei, he did talk more than I am used to but it certainly didn’t slow the class down. I actually enjoyed the slightly different flavor. Early in the class sensei approached a student who arrived late. The student apologized for being tardy but sensei brushed that off and replied, “In the old days, teachers would get angry when students arrived late. Now we are just happy that you come at all. Thank you for coming to my class”. 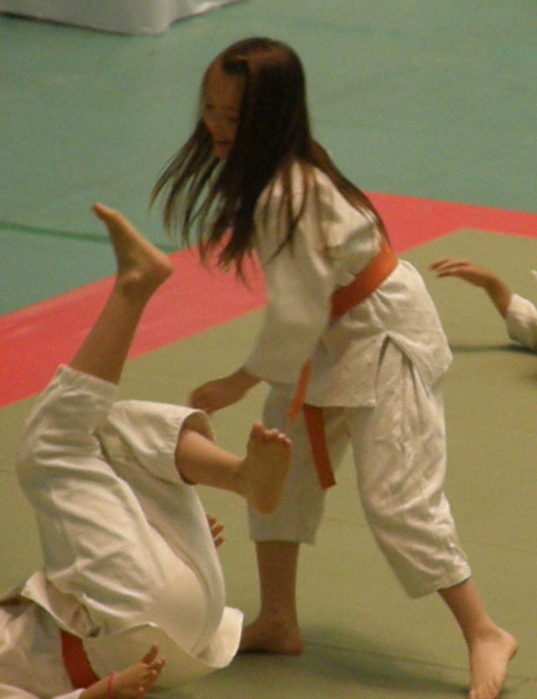 Hearing that sort of attitude expressed by a senior (in rank and years) sensei was refreshing. My partner that evening was an Iranian with a particularly martial flair to his movements. Every entry and most turns had some sort of nasty little atemi. Every time I threw an atemi into him he blocked appropriately. As class progressed, we also progressively increased our intensity. Space was limited so we neither threw too high nor too hard but we did move and strike quickly. 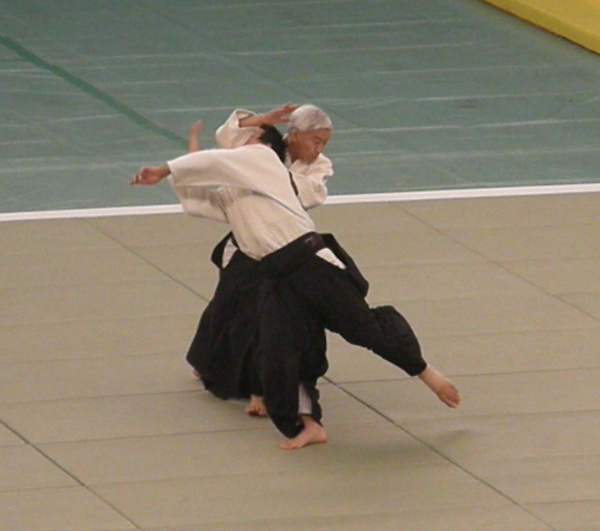 Despite the speed our Aikido itself was pretty calm and smooth (my body just moves better in the evening). Every-so-often we tried reverses but even then avoided brute force. 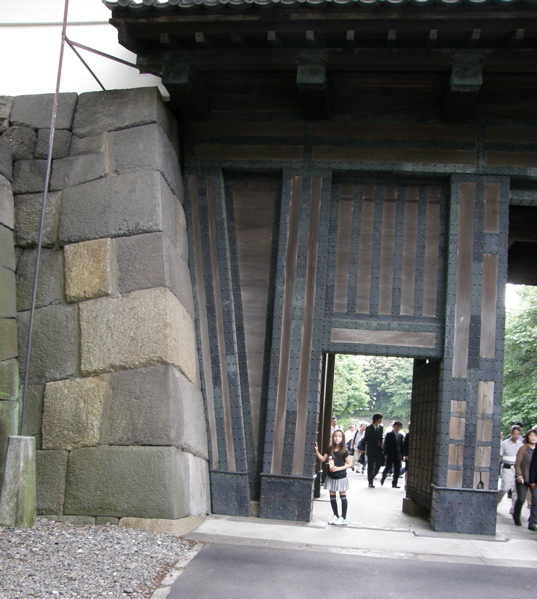 Even so, Sensei noticed us and made a point of stopping us for a moment. He said that when we go back to our countries to teach we couldn’t just teach the “hard stuff” we also had to demonstrate soft Aikido as well. Thoughts of home have been coming to me more frequently lately and this reminder of it in an Aikido context was oddly disconcerting. One moment I was keeping a very serious martial artist from punching my throat and the next I was thinking of family, friends and life at home — very distracting. It was flattering that he seems to expect us both to teach. All in all, it was a good evening and my partner was brilliant. I had not trained with an Iranian before and can only believe that when he does return to his home country he will have a wealth of Aikido to teach.